A street serves as a social and economic link between people. Since the invention of the wheel it allows the transportation of vehicles, goods and people. The street is part of our infrastructure and part of public life. When a protagonist leaves a room the street in suburban areas links us to the next location, to meet others or to withdraw oneself after finishing work, sometimes the street even becomes the central setting itself. 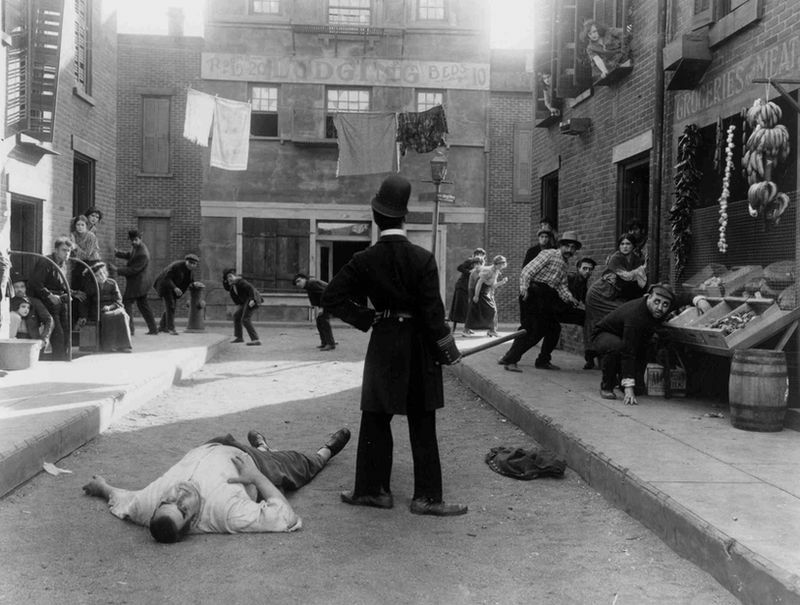 In “Easy Street” 1917, the street serves as centre stage. The tramp-turned-police officer has to make a stand in the inner city, where either the social human being or the antisocial mob has the upper hand. Also “Mean Streets” 1973 portrays the street as pretty ruthless. The young Italians of “Little Italy” have been ruling the streets, claiming their territory. And in “Bad Lieutenant” 1992 the police have failed to control the streets and have become part of what they set out to fight against. The street can also be an extended part of a room, either by using a shop window, or when the lights of the train station shine into the cheap hostel or apartment, “Müllers Büro” 1986. Out of town the street can be seen as the central theme for freedom. Armies of soldiers with military equipment march the streets to take freedom from others; refugees are desperately trying to maintain theirs. The individual is strong as long as it can prove itself on the street, “Vanishing Point” 1971. A person seen out alone on the street is the ultimate symbol of a lost soul, as in the opening sequence of “Omega Man” 1971. Yet just how vulnerable humans become on the street is portrayed in “Ice Storm” 1997.Once we step out onto the street we have lose the security and safeguard offered by a building. We become vulnerable, even if differently than expected.